Oh… things are turning inward. We got back from vacation and I scurried around the farmers markets grabbing the last of the season’s tomatoes, etc. I also made a trip to the folks’ to see if anything was left in the garden. I found a handful of nasturtium flowers for one last salad and buckets of rosemary blooms. It was freezing that day, but shivering and with blue fingertips I picked as many as I could. They can be anything from white to purple to blue and they’re just gorgeous sprinkled on sandwiches, salads, pasta… In this sandwich, they add a nice herbal kick to the creamy goat cheese and tart sweet apple. The Pink Pearl Apple is a beautiful apple, similar in color to a watermelon radish, but any apple will do, just make sure it has good texture and tastes good. Rosemary flowers–as many as you can gather and whatever you have left over will look great sprinkled around the serving dish as a garnish. 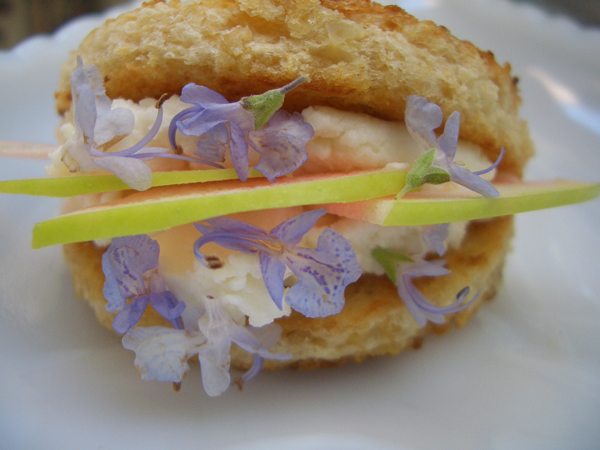 Thyme, sage or basil flowers or a chiffonade of nasturtium flowers would also work. 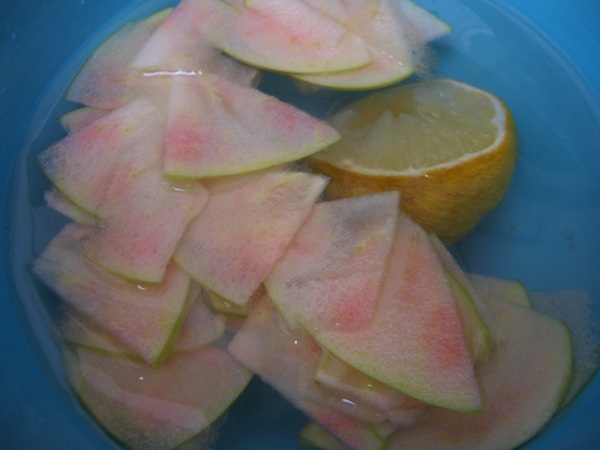 As soon as you slice your apples put them in a bowl, cover with water and squeeze the juice of a lemon into the water. Set aside. 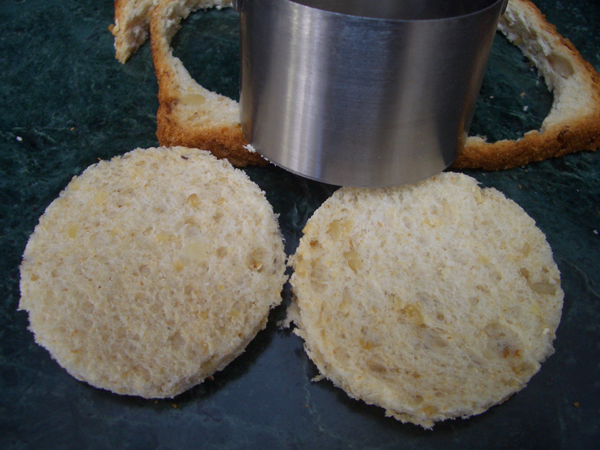 Use the biscuit cutter to cut circles out of the bread. You’ll get about 2 per slice. The residual bread and crust can always be tossed in the food processor and made into bread crumbs. Spread a thin layer of butter on both sides of the bread. Toast the bread in a frying pan over medium heat until golden brown on both sides. Let cool. If using rounds, cut each circle in half. 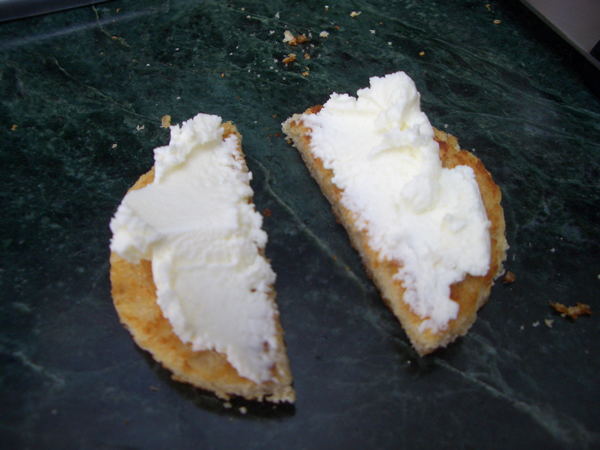 Spread a little softened goat cheese on both halves of the cooled bread. To make sure you have enough for all your sandwiches, do them all at once. That way, if you’re counting on 24 sandwiches, and you go a little heavy on a few and run out, you can redistribute the cheese without pulling anything apart. Drain the apple slices and pat dry with a paper or clean cloth towel. 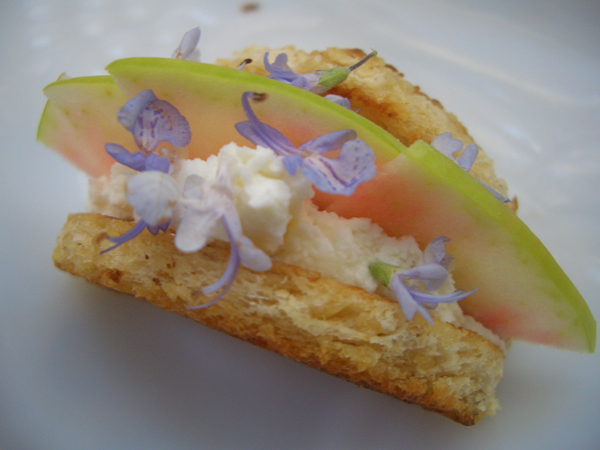 Fan the apple slices across the goat cheese on one side of the bread. Press the other half on top. 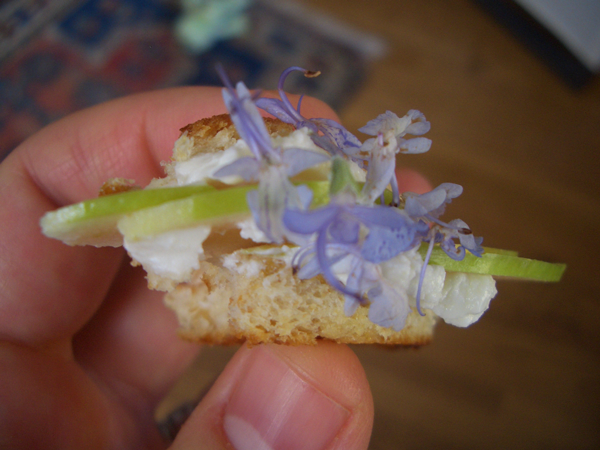 Sprinkle with herb flowers, gently pressing them into the cheese. Serve immediately or cover until ready to use. These would not be a good sandwich to make ahead and keep in the refrigerator. I think the toast would get soft. But you could make them in the morning and keep them under plastic wrap or in an airtight container at room temperature until ready to serve.